So, another event comes to an end. I am so very honored to have hosted it. Thanks to Kiran for letting me host it. It is such a great event, which encourages everyone to cook and enjoy whole foods. For my event, the main ingredient was Quinoa. Enjoy guys !!! If I have missed someone's recipe, please let me know. 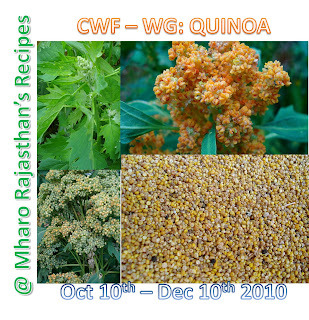 Current Cooking With Whole Foods - OATS event is being held @ Priya's Easy N Tasty Recipes. Please do check it out. A wonderful round-up for the Quinoa Event.Thank you for hosting the event and makng it a success.You are welcome to host it again in the future if you are interested. Awesome round-up. Yummy recipies to try. Many dishes to try and taste, beautiful roundup.. Thanks for the excellent roundup Priya! Wonderful roundup . lot of good dishes. good round up n lovely recipes ! Lovely roundup Priya..not an easy ingredient, guess I can now get to that packet of quinoa sitting in my pantry!! Priya, you have been tagged. See my post "I am Tagged" and answer the same questions. What a delicious round-up Priya! Lots of great recipes! thank you so much priya, lovely round-up, thanks for including my post.